The two-story building featured Greek architecture mixed with the Queen Anne style. 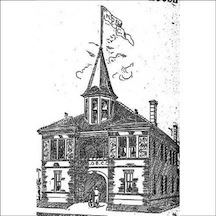 The building included a room for storing bicycles, a billiard room, two bowling lanes, janitors’ quarters, a reading room, two parlors, meeting and committee rooms, and a ladies’ boudoir. 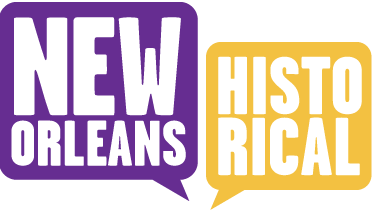 Founded in 1881 by jeweler A.M. Hill, the bicycle club was the first in New Orleans. Mayor Joseph Shakespeare gave an address commending the club for its crusade for road improvement, noting that it was through the “magic wand” of good roads that the Garden District came into being. In 1886, three members of the New Orleans Bicycle Club made a historic cycling tour from New Orleans to Boston in 30 days. Throughout the 1880s and early 1890s, the club, along with the younger Louisiana Cycling Club, sponsored bicycle races that drew enthusiastic crowds. One of these races was the Thanksgiving Day road race of 1887. The seven-mile race from the corner of Canal and Claiborne to the West End was viewed by many from a train used as a moving grandstand. 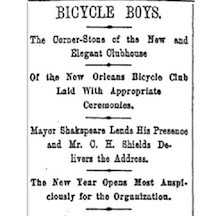 Lacar Musgrove, “New Orleans Bicycle Club, Clubhouse, built 1892,” New Orleans Historical, accessed April 24, 2019, https://neworleanshistorical.org/items/show/504.